In this article we will be checking out the best mitre saw brands in the UK. In the tool industry, and that includes mitre saws, there are many different companies and brand names competing for your business. Competition is good as it provides the consumer with a wide variety of choices, options, and price points for the same type of product. That said it also creates a lot of confusion when it comes to making the best decision. Different brands will go after different types of customers, and this is known as demographic or segment marketing. Some may target professional contractors, whereas others may go after the person, who just needs a general purpose saw. Others target buyers who do not want to spend a fortune. For the average person that means you just need to figure out which brands to explore when you are shopping for a particular type of mitre saw. We have reviewed and researched a few of the most popular mitre saw brands to provide you with this information in one location so you can easily make a decision. We have also featured actual products for each of these companies to help you. The products can be purchased online, often at prices lower than in retail stores (even after shipping fees). There are also many special offers to be found online if you know where to look. Dewalt is probably the most recognised brand in the Power tool market. With over 90 years of experience behind them they brand themselves on tools for the professionals. The main theme of their brand is toughness and durability. It is little wonder that they are the best selling brand out there, and it is a reputation that has been hard earned. In my opinion, they also make the best power tools on the market. That said, they come with a high price. These are great for the professionals who need a tough and durable saw, that will be used on a regular basis. Most home owners will not need something of this quality or price. This Evolution brand is based in Sheffield, England and they are best known for their “RAGE” and “FURY” ranges of mitre saws. In particular they focus their efforts on single and double bevel compound and sliding saws. 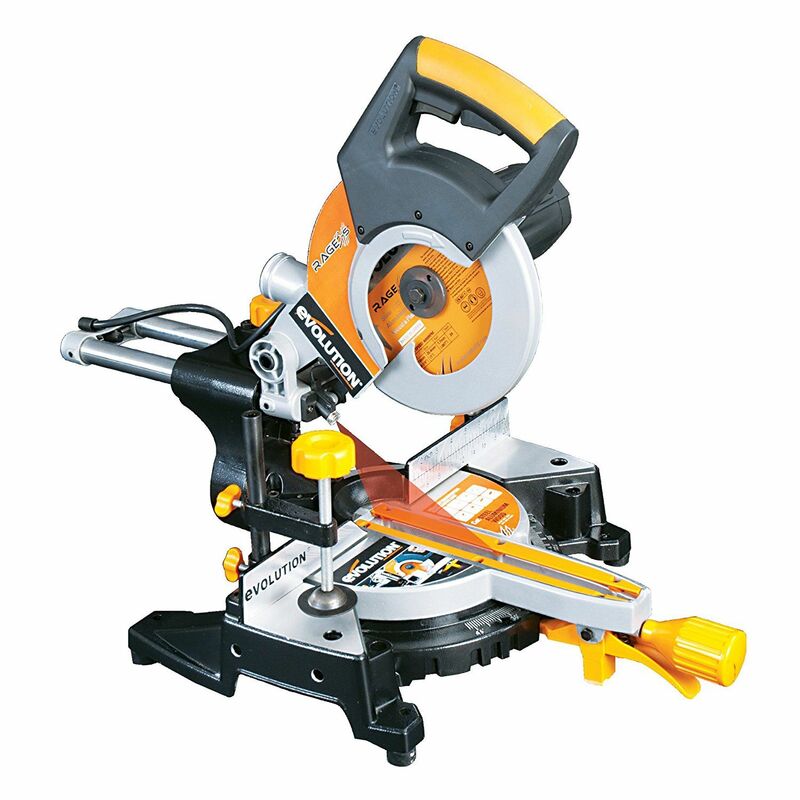 These are popular choices for many customers, as they come in the popular range size of 210 mm and 255 mm saws. They are stocked in the UK by B&Q who usually offer them along with other main brands. They are by a very long way the most affordable of all the brands out there right now. That makes these Evolution branded saws a very popular choice with many UK buyers. If you are working on a home project such as a decking or laying floors, skirting boards etc, then one of these saws will be ideal for you. Metabo have a most interesting logo which is “work. don’t play” They have built their brand name around the entire theme of their products being reliable, irrespective of the type of climate that you are working in. They do not claim to be a cheap brand, but they do want to be known as a brand that has been designed with the craftsman in mind. Their tools are very high quality though and more expensive than other brands. They sell reasonably well in the UK market, but they would not be as popular as the Evolution brand shown above. If you have bought any type of power tools, or indeed gardening tools, then you will already be familiar with the name of Bosch. They produce a high standard of product, and they keep their price points at the affordable range. This is a brand that I have started to like more and more. A few years ago I had never really heard that much about Makita. More and more these days, their tools started to appear in all the major tool outlets. They have a massive research and development department located in Japan where they try to create new products and improve on some features of many existing tools. Find out more about this exciting innovative brand here…. There are of course many other brands who sell these saws in the UK. These are brands such as Einhell, Pingtek, GMC, VonHaus and others. I have never used any of their products so it would be unfair to pass any comments about them. The other brands that I have mentioned have been around for a very long period of time and I have used many of their saws at different times. Personally I like to stick with just a few brands as I know I can get reliable customer service and parts whenever I need them. Dewalt and Evolution appear to be the big 2 brands in the UK when it comes to those that have the best overall reviews and ratings. Evolution are cheaper than Dewalt, and most home owners will opt for a saw from Evolution, whereas the professionals and woodworkers will opt for the higher priced and higher quality Dewalt brand.